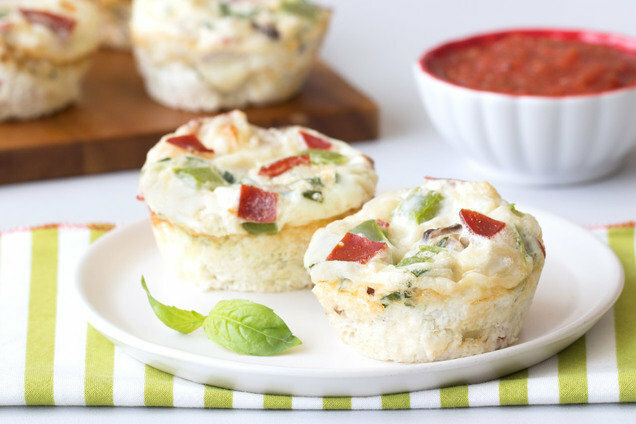 These egg bakes are incredible as make-ahead breakfasts, mid-day snacks, crowd-pleasing brunch bites... You name it! Forget cold pizza for breakfast... We've got a better idea! Bring a skillet sprayed with nonstick spray to medium-high heat. Add bell pepper, onion, and mushroom. Sprinkle with 1/4 tsp. garlic powder, 1/4 tsp. onion powder, and 1/8 tsp. each salt and black pepper. Cook and stir until veggies have softened and lightly browned, about 4 minutes. In a large bowl, combine egg whites/substitute, 1/4 tsp. garlic powder, remaining 1/4 tsp. onion powder, and remaining 1/8 tsp. each salt and black pepper. Whisk thoroughly. Add cooked veggies, cheese, basil, and 3/4ths of the chopped pepperoni. Stir to mix. Evenly distribute mixture among the cups of the muffin pan. Top with remaining chopped pepperoni. Bake until firm and cooked through, about 20 minutes. In a medium bowl, combine tomatoes, Italian seasoning, and remaining 1/2 tsp. garlic powder. Mix well. Microwave for 45 seconds, or until hot. Serve with egg bakes for dipping or topping. Sausage, potatoes, cheese... This is some serious comfort food! Prepare sausage patties in a skillet sprayed with nonstick spray or on a microwave-safe plate in the microwave. (See package instructions for exact temperature and cook time.) Crumble or chop. Bring a large skillet sprayed with nonstick spray to medium-high heat. Add onion, bell pepper, and 1/8 tsp. of each seasoning. Cook and stir until veggies have softened and lightly browned, about 4 minutes. In a large bowl, combine egg whites/substitute with remaining 1/8 tsp. of each seasoning. Whisk thoroughly. Add crumbled/chopped sausage, cooked veggies, thawed hash browns, and cheese. Stir to mix. 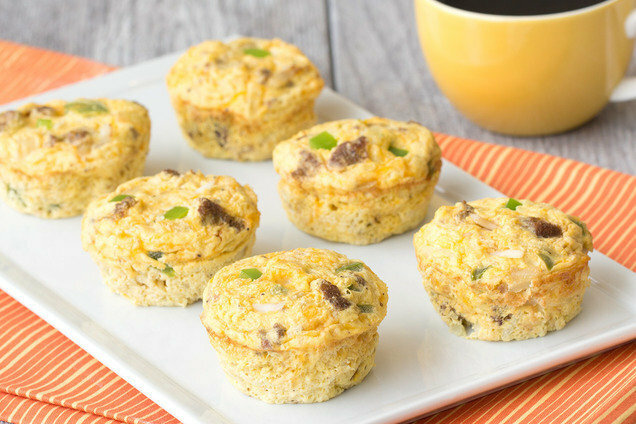 Evenly distribute egg mixture among the muffin cups. If you're not eating the egg bakes immediately, let them cool completely. Then cover and refrigerate until you're ready to eat. For best results, reheat in the microwave. First, wrap an egg bake in a paper towel. Then microwave for 20 seconds, or until hot. Easy! Are you enjoying National Turkey Lovers' Month? Yup, it's June, not November! Celebrate with these Unique Greek Turkey Burgers. Don't let your friend eat lame things for breakfast -- click "Send to a Friend" ASAP!